Last Thursday was a significant day. I ran out of To Dos! The past few months have felt like some kind of juggling act. There were all these new and very time-consuming activities that I just added to my regular roster of activities. I had a long and daunting list of chores and tasks that didn’t look like they’d ever get done. And then, one day they did get done. Even the long and complicated ones! I attribute it to Trello! Trello is a free web-based productivity app. You create an account on the online version, then you can download the versions for your phone or iPad and everything syncs together seamlessly. I’ve tried a lot of calendar and productivity apps over the years. I get excited over them for a week or two and then the love fades. Nothing has really matched my Stephen Covey three-ring binder weekly planner form the 90’s that I had to discard because it was too heavy and bulky and the Sony Clie that I used after that had really cute icons and the amazing Datebk 5 app but also the fatal flaw of losing all its memory whenever the battery died. 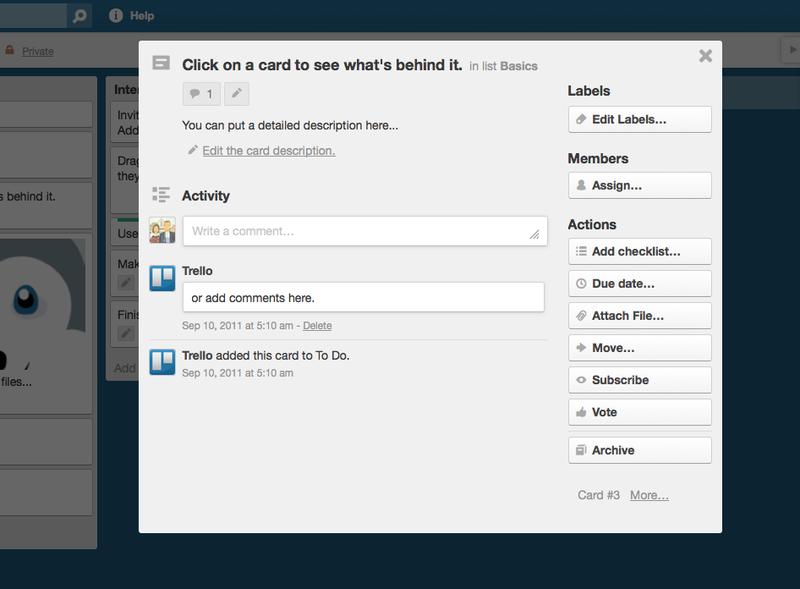 Why I Think Trello is IT! With most other apps, you usually view your tasks and to dos either by time or by category. You might look at either a daily, weekly, or monthly calendar to see what you have scheduled. Or if you organized your tasks into categories, then you look at groupings such as “work”, “school”, “personal” and “family” to see what important tasks you have listed. There’s a better way! Calendars are useful for keeping track of appointments and due dates, so that’s a useful feature to have. But better than compartmentalizing all your chores into different categories is looking at the big picture. Think about it, no matter how many categories you subdivide your chores into, there is still just one person responsible for the chores — you! And you only have 24 hours in a day, 7 days in a week to do those chores. So it’s better to list down every single chore and task you can think of, put it all in one place where you can see everything at a glance, and THEN decide which ones you will spend time on. 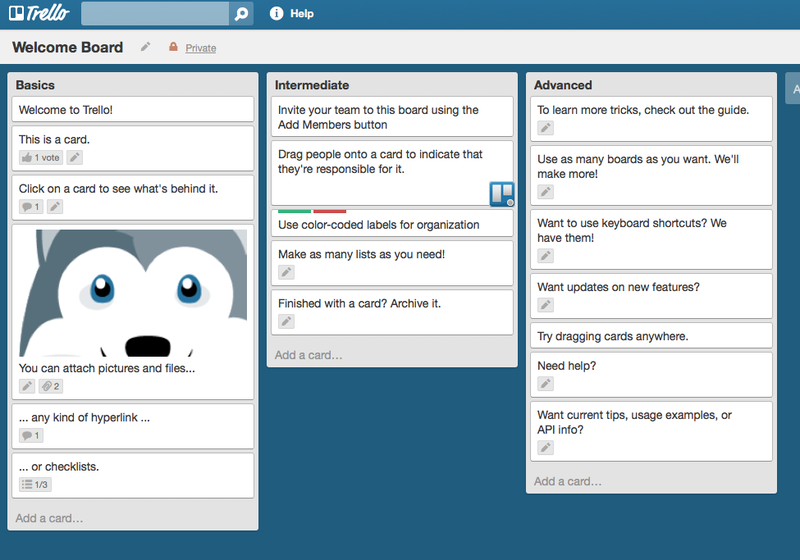 You can make as many boards as you want on Trello, but I think it’s better to stick with as little boards as possible. I have two: “All My Stuff” and “Lists”. This is my Trello board called “All My Stuff”. The projects are called “To Do”, “To Buy”, “Waiting”, and “Sometime in the Future”. My “Lists” board has things like “Movies I want to Watch” and “Books I Want to Read”. The Trello developers packed in a lot of really nifty features! attach CHECKLISTS to a card! and a LOT MORE! Including things I may never use like collaborating with others on a group project! When you click on a card, it flips over and you see the backside. That’s where the checklists, notes, and other things are. The biggest downside of Trello is that you need to be connected to the internet to use it. It doesn’t have an “offline mode”. When there’s no internet connection, you can still view your boards but you can’t edit them. So far, I’m ok with this because I can get internet on my phone while I’m in the farm! I found out about Trello from Zenhabits who learned about it from The Naive Optimist. You can click on the links to read how they use Trello. 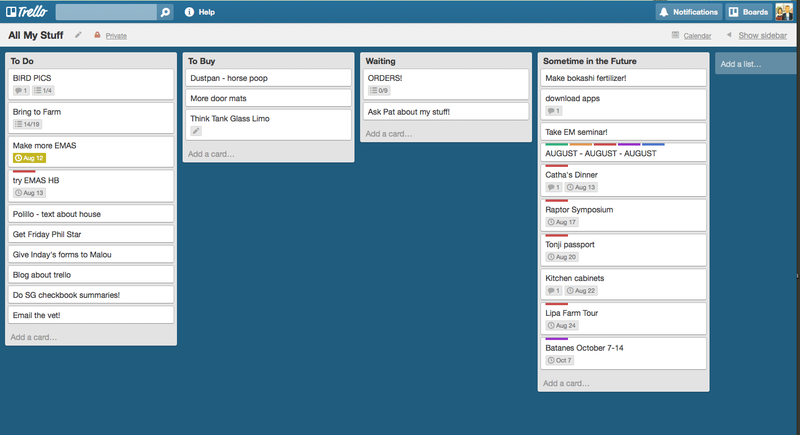 For now, Trello is IT for me. And I’m hoping the developers fix the “offline mode” so I can still do my Trello even without internet. I’m a happy farmer now and not feeling overwhelmed by all all the things I want to do! Previous Previous post: Horses, I Have Grossly Underestimated You!